This dialog box is identical for both customers and suppliers functions. The following explains the functions related to customers, but they also apply to suppliers. As long as you have not indicated the customer or supplier group, the customer menu choices are disabled. Select the generic group or account that contains the Customers or Suppliers list. The group or the account needs to be already present in the Accounts table. See Setting up the Customers' register and Setting up the Suppliers' register. The due date if you entered it into the transaction row. If there is more than one date for the same invoice number, the most recent one applies. If the number of days is indicated in the PaymentTermInDays column of the Accounts' table, the date of the transaction, incremented by the number of days set. The date of the transaction is incremented by the days indicated in the settings dialog box. 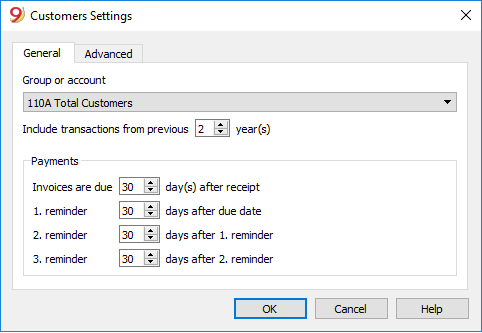 If 0, the program will not display invoices from the previous year, but only the opening balances of the customer account. If 1, the program will also include the invoices of the previous year in the customer card. If 2 or more, the program will also include invoices from years before in the customer card. You can insert a link to an invoice file (pdf, doc or other) in the Link to an invoice field. 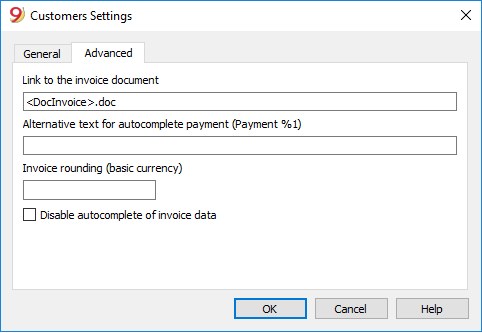 If a link is inserted in the Transactions table and the invoice number is entered in the Invoice column, the program will open the document, allowing you to access all the data contained. The XML name <DocInvoice> or the name of another column contained between <>. If you use the "<DocInvoice>.pdf" command and you are on the row with invoice number 100, the program will try to open the "100.pdf" file. You can also prefix the filename with the name of a directory. You can use any file name extension. This extension must, however, be included in the list of file extensions considered safe (Tools- Program options-Advanced). It is also possible to indicate a path preceding the field name, that consists of the name for the document to be opened. With the link "c:\temp\<DocInvoice>.pdf" and the invoice number 100, the program proceeds to open the file c:\temp\100.pdf. The name of the directory is relative to the directory where the file is located. Choose the command Open invoice link.